BE WARNED: We're hearing about more bike thefts than ever -- out of garages, in front of restaurants and bars, even from driveways as people prepare to go for rides. Remember: Lock your bike at ALL times (even in your garage!) 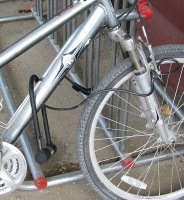 and read our article, 5 Tips: Preventing Bike Theft, for the best ways to lock it up. You can also follow Cleveland Stolen Bike Alerts on Facebook to get the word out about your stolen bike or to help others find theirs. New Surly Bikes colors now in stock! Take our online presidential poll! Deagan's Bike Night Finale Tonight!